This past June, around seventy-five graduate students and faculty members joined Dean Dan Jay and Associate Dean Dan Volchok in the DeBlois Auditorium to reflect on the previous year’s progress and endeavors at the Sacker School. Various community leaders briefly presented on topics that reflect the Deans’ new mission of training to career excellence followed by open discussion between all attendees. Following the larger meeting, attendees continued to engage in these topics in smaller groups over lunch to continue pushing these goals forward in the coming year. Jay opened the meeting by reviewing the results of career development “trial balloons” that the new administration worked towards last year. He celebrated the high interest and positive reactions from trainees for the new short courses, including Introduction to Drug Development (50 attendees), Navigating the Corporate Environment (22 attendees), and the R Programming Workshop (34 attendees). Building on this positive momentum, additional short courses will be offered in the coming year. A ‘science storytelling’ workshop and an entrepreneurship short course have been developed for the fall semester, with a teaching short course planned for the spring. There are also plans to develop the Introduction to Drug Development course into an official Sackler-wide elective for the spring semester. In addition, two career counseling workshops by Sarah Cardozo Duncan will again be offered in the 2018-2019 for students and post-docs who are interested in industry-related careers. Not all career development endeavours in Sackler last year had such immediate success, however. The initiative to place students who have completed Year 1, Year 2, or their thesis requirements in summer industry internships encountered several difficulties, including reluctance from potential partner companies. That reluctance mainly stemmed from aversion to such a short internship time period (3 months), as several companies in conversation with Sackler administration requested at least a 6-month full-time commitment from students. Meeting attendees generally agreed that this length of time would be difficult for both PIs and students to commit to without serious disruption to research progress. However, there was at least one successful internship negotiation and placement, suggesting that the program may still be developed but not in as broad a manner as originally intended. A case-by-case determination was concluded to be the best approach moving forward, with the requirement for extensive conversations and mutual agreement between student, PI, and hosting company on timeline and degree of commitment being emphasized. In reiterating his desire to see Sackler become a leader in career training for biomedical graduate students, Jay described his aspiration to develop a tuition-bearing, two-year master’s program in Biomedical Leadership. Matriculating students would have the opportunity to train for various career tracks related to biomedical research, and their curriculum would include current and future career development short courses or electives offered within Sackler. During the group-wide discussion session, the possibility of offering a 4+1-style master’s program in collaboration with the undergraduate branch of Tufts University was put forward and positively received. Another main topic of the community meeting was the state of graduate research training at Sackler. Opening discussions involved debating the merits of switching from the current program-specific curriculum design to a single core curriculum that all first-year graduate trainees–regardless of program–would take. Across programs, students generally were opposed to a core curriculum in regards to scientific content, emphasizing that most seek a graduate education specifically to specialize in a particular area. They did support the suggestion that any core courses in scientific content should be ‘nanocourses’, instead of full required or elective courses. In contrast, developing a skills-focused core curriculum that included classes such as research methods, quantitative biology & bioinformatics, and statistics seemed to have wide support from both students and faculty. In addition to curriculum content, the possibility of expanding the MERGE (Medically-Oriented Research in Graduate Education) beyond the Immunology and Molecular Microbiology programs was discussed. The MERGE program trains participants in clinical aspects of their research area during the summer prior to their first graduate year at Sackler. During this time, they are also paired with a clinical mentor who provides them direct contact with patients and clinicians and serves as a thesis committee member during their research training. Given the proximity of Tufts Medical Center, it was advocated for the Sackler School to take advantage of the opportunity to give more PhD students training in regards to the clinical impact of their research. Genetics and Neuroscience were considered as programs which MERGE could expand to, but no specific plans for that expansion were discussed. Strengthening the Sackler community was also a significant theme of the meeting. During a discussion about building diversity and inclusion at Sackler, students expressed the need for more structured support from the school. They expressed that while student-led initiatives such as SPINES (Students Promoting Inclusive Excellence at Sackler) provide excellent resources and opportunities for underrepresented minority (URM) students, the responsibility of delivering such support should not fall so heavily on the trainees themselves. Through this discussion, it was emphasized that bringing more URM junior faculty–from Tufts or other institutions–to speak at graduate seminars could help build networks for students to rely on. In addition, hosting a greater number of Sackler-wide events during the year, especially during recruitment, could foster a greater sense of community and provide more school-directed opportunities for URM individuals to connect across programs. Another discussion about community building focused on developing stronger alumni networks. The career development short courses were one way in which the Dean’s Office started on this initiative already. Various alumni contributed their expertise and their time to the courses’ development and operation, which was key to their success; this arrangement also provided a structured environment in which students could take the opportunity to develop professional connections with alumni in their career areas of interest. Given the positive outcomes from this year using this approach, there are plans to build on this foundation for similar endeavours in the future. Dean Jay also discussed his efforts over the last year in reaching out to Sackler alumni for fundraising, which he had done in collaboration with Roxanne Beal from the School of Medicine’s Office of Advancement and Alumni Relations. To broaden this effort, faculty were encouraged to reach out to their former trainees, and the group supported the idea of current students reaching out to alumni for an annual fund. Overall, the morning and lunchtime discussions provided great insight into the past year’s success as well as highlighted what aspects of graduate training at Sackler still need to be strengthened, and the dialogue between students, faculty, and staff generated actionable items for the administration to take on in the coming academic year. There was an excited tension in the humid halls of Boston University the morning of August 19th, where women from eight institutions across New England were finally coming together under one roof. For months leading up to this day, representatives from each school spent many a late-night brainstorming, planning, and organizing, not just the Inaugural Retreat they were attending today, but the genesis of a new organization whose mission would be to unite, diversify, and advocate for women in science and engineering throughout New England. They had just founded NEGWiSE: New England Graduate Women in Science and Engineering. The retreat kicked off with the keynote speaker: local entrepreneur, founder, and CEO of Seeding labs, Dr. Nina Dudnik. Her nonprofit company brings scientific equipment and training to underserved areas worldwide, and the theme of her talk was collective action. As she spoke, she acknowledged that tens of thousands of protesters were currently marching on the Boston Common to protest racism and hate speech, and many in the audience had cut their marches short to hear her speak. Protest signs littered the aisles as Nina pointed out that by taking the time to support fellow women here and now, when there were other pressing and important issues, strongly demonstrated the passion and dedication of everyone in the room. Continuing to echo the national conversation, Nina emphasized that the time for talking is over, and she urged, to many a nodding head, now we must act. Nina talked about her time as a graduate student at Harvard Medical School, where she overcame extreme gender imbalances to find mentors and advocates, and ultimately changed the demographics of her department to hire more women. She spoke of how we as women in science must work harder, be more productive, and walk a fine line to be just the right amount of outspoken but likable – feminine but firm. She said that often we, as women, do this with an apologetic meekness that we must shirk to accept full ownership of our accomplishments. Her advice: practice saying the words “My name is…and I am an expert in…” because this is something we consistently feel shy about, regardless of our achievements or awards. But we can help each other do this too. Nina encouraged us to amplify each other’s voices; whether in meetings, in lab, or online, me must give and receive credit. We must also repeat, reinforce, and validate other women’s viewpoints so their voice, and our collective voices, can be heard. We can build an ‘old girl’s network’ of our own. This is a kind of power we can harness to act on, to affect change, and keep improving. Nina reminded us that we as women are already working overtime; here we are choosing to spend our Saturday, not on the couch watching TV, but actively working to both question and improve the status quo, all the while standing in solidarity with other women. But as a new group, Nina stressed, it is important we distinguish ourselves, to find a niche among the multitude of women’s groups in the Boston area. As her keynote wrapped up, the room was uplifted with a common hope and strength. Nina put words to the thoughts we all had- that together we have the resources not just to talk but to act, and facilitate important and sustainable change. Building off the groundwork laid by Nina, the next part of the retreat featured short presentations from each school about their GWiSE groups, where representatives from Tufts, Boston University, MIT, Northeastern, Harvard, Brown, Boston College, and Dartmouth all talked briefly about their strengths and resources, and how they could benefit from a consortium like NEGWiSE. While Tufts does not have a dedicated GWiSE group (yet! ), the Tufts Mentoring Circles stood in to represent Tufts, and will also be supporting the development of a Tufts GWiSE group that’s currently in the making. The bulk of the afternoon was dedicated to several “Breakout Sessions.” These focused discussions were brainstorming sessions on topics such as the organizational structure of NEGWiSE, the role of men, increasing diversity, outreach, and advocacy. Tufts’ own Dr. Ayanna Thomas, professor of Psychology, led the diversity discussion to brainstorm how NEGWiSE could facilitate enhancing diversity, both regarding incoming graduate student demographics and within high level graduate education positions. Likewise, discussion was held about how other GWiSE groups at other universities can help Universities such as Tufts to create their own internal GWiSE group. However, one Breakout session that received a lot of traction was Advocacy. Attendees, added to the momentum started by Nina’s keynote speech through eager discussion of action items affecting graduate students and consideration on how NEGWiSE could implement change. Several issues rose to the top as important within the STEM graduate community, including parental leave policies, mental health, domestic violence, and student/advisor dynamics. 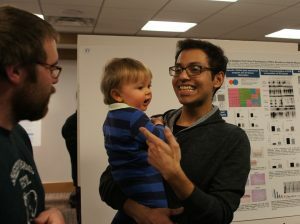 In fact, NEGWiSE decided to take on resource gathering about parental leave policies for comparison across universities, with the goal of proposing a standard policy for graduate student parental leave that can be proposed directly to each administration. This timely issue is the first action item that NEGWiSE will be tackling, but it will not be the last. Through the breakout sessions, the mission of NEGWiSE was refined to include graduate student advocacy as a central tenant, especially for issues relating to women in STEM. It was strongly felt that NEGWiSE will distinguish itself among Boston area groups in this way, while also best serving the needs of multiple universities across New England. But the retreat was not simply all work and no play; after the brainstorming was over, the fun began! Moving from the classrooms of BU to the BU Beach, attendees met and networked with each other over delicious BBQ. A scavenger hunt encouraged people to talk to each other. Attendees needed to find a person who fit each condition from a list. For instance, items included who had run a marathon or who likes Dunkin Donuts better than Starbucks. The first few people to find answers to all those questions won some NEGWiSE swag. A fun photo booth with props got everyone laughing, while a DJ spun tunes, and a Facebook friending frenzy ensued. Written by Daniel Fritz and Judith Hollander. 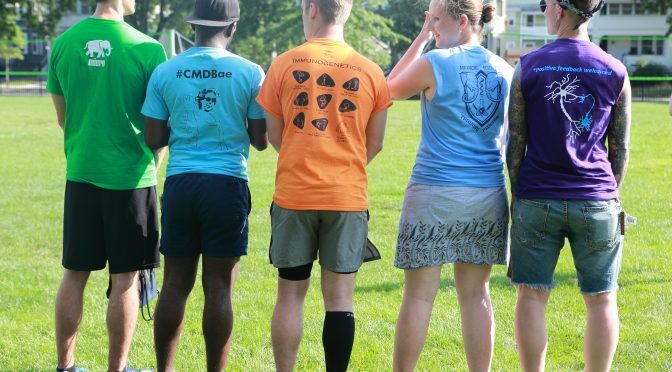 On July 21st, members of each graduate program, eager for a day out of the lab, piled onto buses and traveled to the mysterious Medford campus for hours of friendly competition and socializing for the 22nd Annual Sackler Relays. Wisely, the competitive running events were up first so as to beat the midsummer heat. Runners braved the July sun to compete in a 100 m dash, a 4 x 200 m relay, and a 1 mile race. The women’s 100 m dash was a photo finish with Neuroscience’s Rachel Jarvis pulling out a narrow victory over CMDB’s Joslyn Mills. Immunogenetics took the women’s mile with an impressive 5:25 mile time by Maiwenn Le Corre! Participants and guests enjoyed food and drink as a break before the rest of the contests began. Cooperative weather this year allowed for the return of the full event list, including the volleyball bracket and the obstacle course, with Neuroscience claiming a decisive volleyball victory. Unfortunately, dodgeball was cancelled partway through the games due to exuberant and strong throws prematurely deflating the dodgeballs. 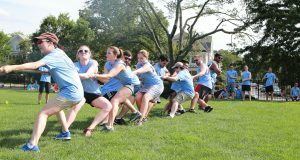 The day ended in a show of great teamwork, when CMDB stole victory from the MD/PhDs in the final matchup of the tug-of-war tournament. Following the sporting events, Rebecca Silver, our new Graduate Student Council president, announced the raffle winners of various prizes, which included day passes for the Rock Spot climbing gym, Paint Bar coupons, and Tufts swag, among other rewards. Our new Dean, Dr. Dan Jay (or, D(e)an Jay, as he quipped), introduced himself to the group and gave a rousing speech regarding some of his aspirations and goals in his new position, including new initiatives towards career development and preparing Sackler students for life beyond graduation. We enthusiastically wish Dean Jay the best of luck and look forward to his leadership! Generous support from the Provost’s Office and the President’s Office were instrumental in making this year’s Relays a success, along with help from the Dean’s Office. The Graduate Student Council, with assistance from Sackler Faculty, held a successful relay day that will only raise the bar for next year! 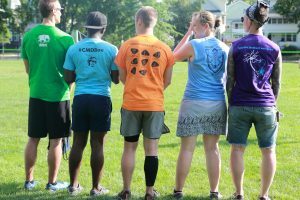 Thank you to Microbiology’s Claudette Gardel for team and event photos, and thank you and congratulations to all who participated! 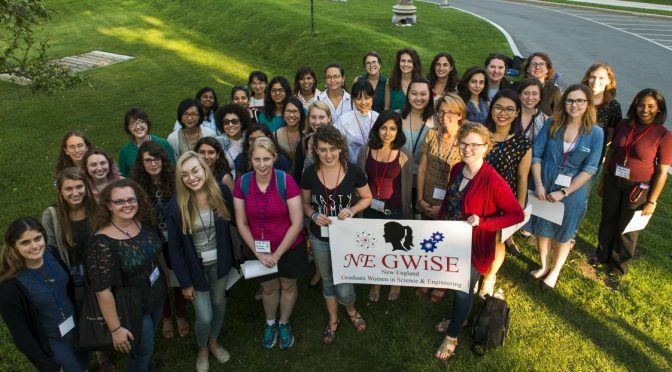 New England Graduate Women in Science and Engineering (“N-E-G-wise”) is a new alliance between groups of graduate women in STEM from universities in Boston and across New England. We’re joining forces to address the issues facing graduate women in STEM. 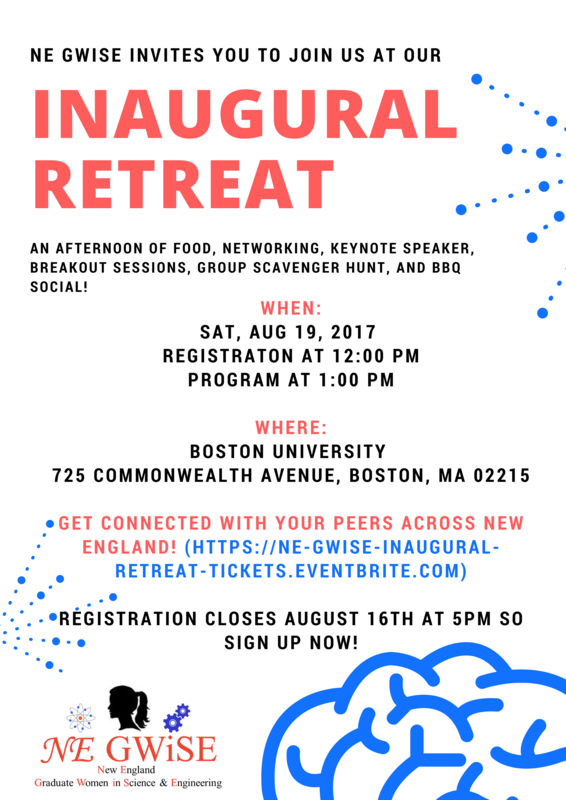 Join us for our first event, the NE GWiSE Inaugural Retreat, this summer! Details can be found below or at our website, https://negwise.wordpress.com . 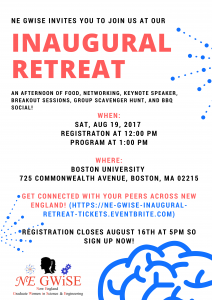 Description: Come join us at NE GWiSE’s Inaugural Retreat- a day of connecting graduate women from different universities and collaborating to help make NE GWiSE an organization that can effectively address the issues we face and create change within our community. We will start off the day being inspired by our opening keynote speaker (TBD). Next, we will have introductions by partner GWISE groups and breakout sessions to discuss how NE GWiSE will function. Finally, we’ll end the day with a scavenger hunt and BBQ social! This is a great opportunity to meet graduate women from different departments and universities, share best practices and recurring issues, and foster collaborations and friendships across the region. We hope to see you there! Registration closes August 16th at 5pm so sign up now! Coffee and snacks will be served throughout the event. Dress is casual. Practice solving cases, gain insight and tips, and learn more about the field of consulting. TBBC, in collaboration with the Office of Alumni Relations will be hosting a speed networking night! Meet fellow students and Tufts alumni who are working in the biomedical field from across all of Tufts campuses and programs, including Sackler, Fletcher, Medical, Dental, Nutrition, and the Gordon Institute. Mingle with old friends and new. We look forward to seeing you! Food and drinks will be served at this facilitated networking event. Dr. Lily Ting is a life scientist and entrepreneur with 12 years of experience in academia and industry. 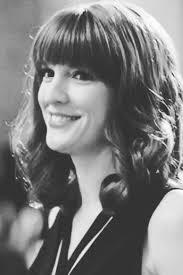 Lily received her PhD from New South Wales University in Sydney and a post doc in the Gygi Lab at Harvard Medical School. After her experience leading projects in the academic sphere, Lily worked in a business development role at Athletigen and is now an Associate at PureTech Health. PureTech is a venture creation firm focused on bringing innovative solutions to the fields of neuroscience, immunology, and gastrointestinal diseases. She is also an avid dragon boat racer and just won gold, silver, and bronze in Puerto Rico! Representatives from ClearView Healthcare Partners will speak to students about consulting and ClearView’s Connect to ClearView program for advanced degree candidates. A well-developed flash talk is an effective tool to quickly and easily communicate your work to others. These take time to develop and usually evolve over a series of iterations. Sackler students will have a chance to give their scientific flash talks before a judging panel and other students. 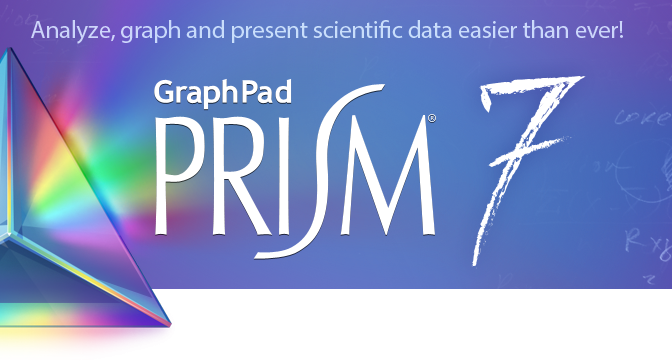 All presenters will receive helpful feedback and compete for nice prizes. This will be a low-key, fun event with appetizers and beer, and a chance to network with other students and professionals. F Feb 24: TBBC hosted Joel Batson, Science Project Manager at RA Capital. Joel introduced students to a new web-based tool he is developing and offered students the opportunity to collaborate with him and his team. Tu Apr 4: Teresa Broering, current Director of R&D at Affinivax, a Cambridage, MA-based company developing a next generation approach in vaccine technologies, and former Director of Immunology at AbVitro as well as Senior Director of Product Discovery at MassBiologics, joined us for a discussion of her career path and her current role with Affinivax, and the current state of the biotech industry. 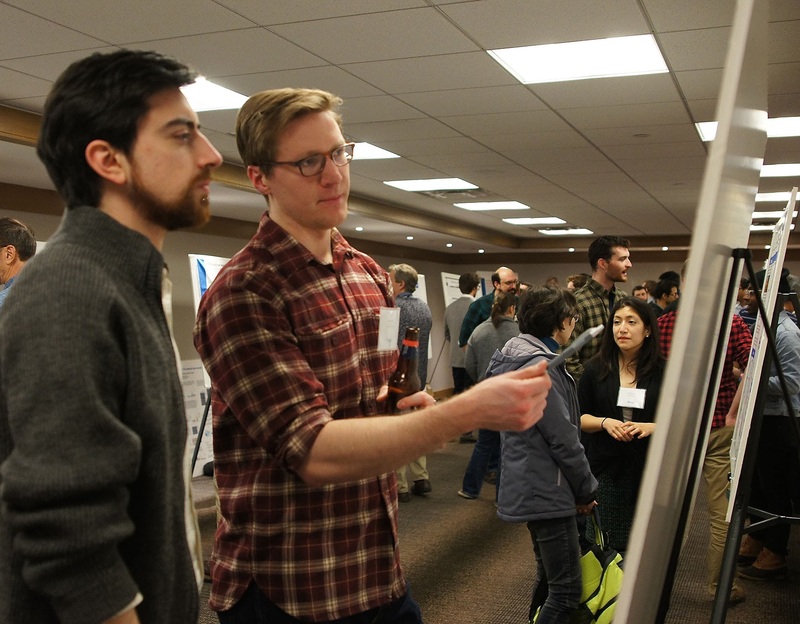 For the first time, the Genetics and CMDB programs came together for a retreat in Portland, Maine for the snow and slush-filled weekend of April 1st. The retreat brought together students from different programs to interact and learn more about one another’s’ research, as well as students from different campuses. Both the Boston and the Bar Harbor Jackson Laboratories contingents made it to Portland to join the Scarborough Maine Medical Research Center Institute (MMCRI) folks for a weekend of science and camaraderie. Students and faculty gave brief talks on their work, followed by a poster session and a fantastic keynote speech on storytelling was given by Christine Gentry. Read on for details on the weekend, written by Jessica Elman (CMDB, Boston Campus), Jessica Davis-Knowlton (CMDB, MMCRI), and Alexander Fine (Genetics, JAX). We kicked off the retreat with a marathon of 16 talks given by students in year four and up from the CMDB and Genetics programs. Given the challenge to present a summary of their work in seven minutes or less, the students delivered with presentations that were brief but pointed. Three winners were selected by Philip HInds, Ira Herman, and Rajendra Kumar-Singh for their exceptional clarity, creativity, and concision. 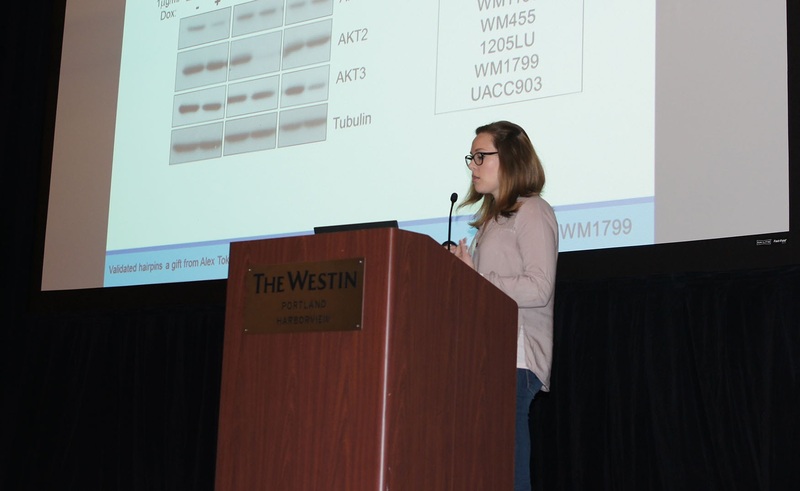 In third place, Melissa LaBonty, a 5th year CMDB student in Pamela Yelick’s lab, presented on her work studying Fibrodysplasia Ossificans Progressiva (FOP). In this rare and severely understudied disease, an abnormal wound repair mechanism results in bone ossification in soft tissue after damage or injury. LaBonty is working with zebrafish to create a model of FOP, which will help to better characterize the disease and understand the underlying mechanisms that drive its progression. In her presentation, LaBonty spoke clearly and at an even pace, with assisting powerpoint slides that displayed only the most essential words: together this style helped keep the group focused on her story and contributed to her ranking as one of the best speakers of the day. 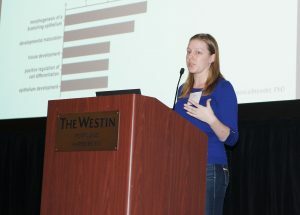 Siobhan McRee, a 5th year Genetics student in Philip Hinds’ lab, came in second among the student presenters. McRee talked about her work in which she is elucidating the roles of different Akt isoforms in BRAF-mutant melanoma. Though this cancer is initially responsive to the drug Vemurafenib, which specifically targets cells with a BRAF-mutation, cells with other driving mutations manage to survive the drug treatment and clonally expand, resulting in significant and potentially deathly relapse of disease. Ultimately, McRee’s work will help to better understand how the Akt signaling pathway is involved in this disease and may result in more therapeutically targetable molecules. McRee’s story logically built from general facts and understanding of BRAF melanoma to ultimately culminate on more specific data showing her findings thus far as well as their implications. Furthermore, her even pace and well-organized slides made her an especially great presenter that day. Coming in first place was Kayla Gross, a 4th year CMDB student in Charlotte Kuperwasser’s lab. Gross’s work involves understanding how aging contributes to the breast cancer development, and why certain subtypes of breast cancer are more prevalent in the aging population. Given the prevalence of breast cancer, the impactfulness of Gross’ research is immediately obvious. She worked with an aging mouse model to characterize their mammary tissue as well as performed an RNAseq experiment to uncover molecular mechanisms that might be differentially expressed in young and aging mouse tissue. Gross presented her data in a logical progression, and used illustrative cartoons and animations to her advantage to keep her audience focused and to get her point across. Besides for her brilliant and captivating powerpoint, Gross stood out for her speaking style: she had clearly chosen her words to be concise and to the point, which allowed her to make the most of the seven minutes allotted to her. All in all, the student presentations were remarkably impressive: in just seven minutes, all the participating students managed to convey the most critical and interesting components of their research. This was a great opportunity for everyone to learn a little bit more about what our colleagues are working on, as well as a chance to practice our “flash talk” skills, which will come in handy whether it’s at a job interview or at Thanksgiving table when your uncle asks you to explain what you’re doing in graduate school for the third time. It was suggested by Terry Pratchett, Ian Stewart, and Jack Cohen in The Science of Discworld II: The Globe that perhaps Homo sapiens as a name for our species is a bit of a misnomer considering we are not omnipotent beings. They suggest Pan narrans, the storytelling ape, because we gain understanding by fitting facts into a larger narrative rather than collecting and storing millions of pieces of disparate information. As communicators of new knowledge to the world (i.e. our scientific findings), it is important for us to keep the nature of our listeners in mind. In her keynote presentation to the retreat, Story Collider’s Christine Gentry, PhD encouraged us all to think about how to frame our narratives to be more approachable and demonstrated some methods of drawing in an audience. She immediately captured our attention and sympathy by describing the challenges she faced in a wending career path that started with her geek excitement to bring a black widow spider to her Texas elementary school show-n’-tell, traversed through public outreach on the topic of zoology, and has landed at teacher/storyteller in Boston. She required us to engage with her material by highlighting snippets of stories that we examined in small groups to find the element that made them compelling. We saw that admitting to vulnerability helps to humanize us to our audience in the story from a researcher who relies on fresh donor tissue, that self identity makes us more honest in the story from a researcher who decided not to cover her tattoos, and that we can surprise our audience by not sticking to script in the story from David who refused to tell the inspiration arising from conflict story that reporters sought to box him into. The thread tying all these stories together is that at the core they are about relationships with others, ourselves, our work, and with the larger community. Scientific inquiry must be done in an objective manner and it is imperative that we remain unbiased as possible when we review scientific evidence, but there is room for us to inject our personalities into our presentations and relate our findings to the people who care. Now it remains to us to decide when to do so and to what degree. On Sunday morning, we took a break from data and lectures; it was time to start working together. The purpose of this retreat was cross-program cooperation, and in our final event of the weekend, we put that goal into action. We separated into breakout sessions, not by program or campus, but by what we are interested in. These small group discussions were designed to get people together with various strengths and experiences to think about how to solve some of the challenges that graduate students face. So what are graduate students at Sackler interested in discussing? The topics of these breakout sessions varied. Some sessions focused on day-to-day problems that a graduate student might face, like using CRISPR/Cas9 or selecting a sequencing platform. In the CRISPR discussion, participants came to the conclusion that there are no specific shared standards for all the applications of CRISPR and identified strategies to address potential off-target effects. Other discussions centered on how to accomplish broader training goals, including grant writing, mentoring, and communicating in science. The grant writing section reviewed general writing strategies, like setting short-term, realistic goals, and shared a need for a formalized grant-writing course at Sackler. The mentoring/leadership session discussed existing programs at Sackler where a student can find a mentor, like the Tufts Mentoring Circles and the Tufts Biomedical Business Club. Students expressed a need for a more accessible alumni network, including cross-institutional resources. In the scientific communication group, students were urged to get on social media platforms like LinkedIn, Twitter, and ResearchGate. 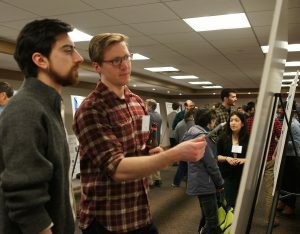 In two of the largest breakout sessions, participants concentrated on solving larger scale problems: designing coursework for a modern graduate program in biology and bridging the gap between science and medicine. 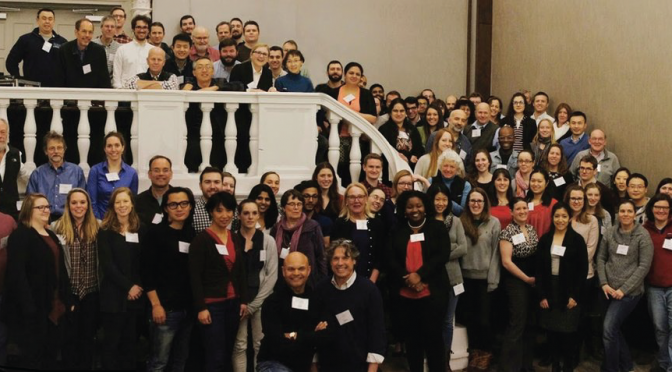 To help bridge the gap between scientific research and medicine at Tufts, the discussion group recommended that faculty members be identified that can connect labs with clinicians and tissue banks. In addition, access to a course that provides a basic orientation to clinical research would benefit many students at Sackler. In the session on coursework for a modern graduate program, one topic became the clear center of the discussion: computational biology! 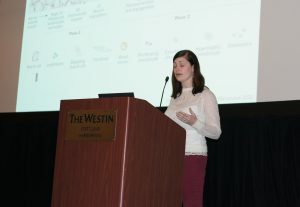 Whether students had struggled through teaching themselves or were currently stuck with a dataset they didn’t know how to analyze, everyone in the room agreed that coursework in computational biology was crucial for a graduate student’s success in modern biology. In addition to new coursework, students from both programs expressed a need for a revision and update of their first year coursework. While all of the breakout sessions at the retreat were productive, they are meant to be starting points for continued discussion and collaboration. This retreat should be the springboard that leads to action across programs and institutions. Sackler students are lucky to be in programs that span multiple states, campuses, and research focuses. The cross talk between these groups will make each of our programs stronger and better prepare us for our careers in the future. Tu Dec 6: Liz O’Day, PhD, presented actionable tips and insight into her transition from the academic world to being an entrepreneur. Olaris is a venture-backed drug discovery company that uses a proprietary NMR-metabolite profiling platform to unlock aspects of human metabolism that could never before be analyzed. Tu Dec 13: Peter Bak, PhD, Manager at Back Bay Life Science Advisors, spoke about transitioning from a PhD program to life sciences consulting and career opportunities at BBLSA. We are having our TBQA-oSTEM Joint Networking Mixer and Panel on Friday, 11/18 from 6:00-8:00pm in the Crane Room on the Medford Campus. Food will be provided! The Tufts Biomedical Queer Alliance (TBQA) invites you to come learn about the current state of transgender healthcare. We are pleased to welcome Dr. Anne Koch, DMD, to share her personal experiences of the healthcare system as both a patient and provider. A professional panel composed of Dr. Julie Thompson (Primary Care, Fenway Health); Dr. Stephanie Roberts (Endocrinology, Boston Children’s Hospital); and Cei Lambert (Trans Patient Advocate, Fenway Health) will join Dr. Koch in a panel discussion of the services they provide from both medical and social perspectives. A complimentary reception will follow. The Tufts Biomedical Data Science Club is a resource for students wishing to learn and apply programming techniques in order to tackle big data problems in the biomedical sciences. No programming experience required! The club hosts bi-monthly meetings, works on group projects, and provides opportunities to hear invited speakers and network with others interested in big data. Please email Matt Kelley at matt.kelley@tufts.edu with any questions. Olaris is a venture-backed drug discovery company that uses a proprietary NMR-metabolite profiling platform to unlock aspects of human metabolism that could never before be analyzed. Focusing on diseases with limited to no treatment options, Olaris uses their technology to uncover previously unknown biomarkers and molecular targets to develop breakthrough therapies that fundamentally alter how these diseases are diagnosed and treated. Join us for a discussion with Peter Bak, Manager at Back Bay Life Science Advisors. Dr. Bak will talk about transitioning from a PhD program to life sciences consulting and career opportunities at BBLSA. Th Oct 6: TBBC hosted Sackler alum and Partner at Health Advances, Dr. Donna Hochberg (SK03), who discussed the career path that led her from the bench to her current role as the leader of the firm’s Diagnostics and Life Science Tools Practice. She also led the group through a business case study exploring the challenges of bringing diagnostics to market. F Oct 21: Hannah Mamuszka, picked by Future of Biopharma as one of 5 women to watch in Boston, and founder and CEO of Alva10, a company specializing in precision medicine, joined us for an informal conversation about the future of diagnostics, the latest news in biotech, her career, and Alva10. This year, the graduate student and post-doc mentoring circle programs have merged together to form a larger, single Tufts Mentoring Circles program that started for the 2016-2017 academic year with a kick-off event on Thursday, October 6. In total, 71 people are participating in the Mentoring Circles program this year: 24 mentors, 21 graduate students, and 26 post-docs between the Boston and Medford campuses. These mentors, who are faculty, post-docs, senior graduate students, and industry and non-traditional professionals working in different fields, will be working in pairs to advise and facilitate discussions with small groups of post-doc and graduate student mentees over the course of this year. Mentors and mentees were matched together based on their personal and professional development interests indicated in the registration survey that was available online in September. Each group, or circle, will meet monthly on their own schedules to have discussions as they see fit on topics they choose. A closing event will be held toward the end of the academic year, likely in May or June 2017. Registration is now closed for the year, but for more information and to be notified when registration opens next year, contact us at tuftsmentoring@gmail.com. The graduate student-focused Tufts Mentoring Circles program was founded in November 2014 through the Sackler GSC as a peer mentoring program to serve the professional and personal development needs of graduate students, and also facilitate inter-program and -department communication and collaboration. Tufts Mentoring Circles is based on the Association for Women in Science (AWIS) Mentoring Circles program.